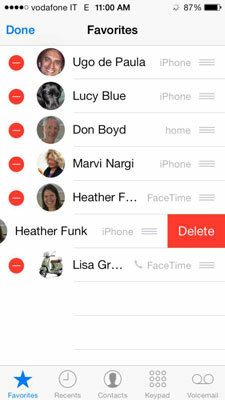 When you make or answer a call, the active call screen appears on your iPhone. The Active Call screen displays information about the person or business you’re speaking with such as the phone number or name, and the length of time you’re engaged in your call from the moment you connected. You’ll also see a photo of the person if you saved a photo with his contact card in Contacts. Mute: Tap Mute to prevent your caller from hearing sound on your end of the conversation, even though you can still hear your caller; tap again to turn off Mute. Hold: Press and hold the Mute button; the mute button changes into the Hold button; tap Hold again to turn off Hold. When you place a call on hold, neither you nor the person on the other end can hear the other. Keypad: Tap Keypad to display the keypad, and then tap any numbers or the * and # buttons to do things like respond to options when calling automated customer service phone numbers, or check your work voicemail inbox. Speaker: Tap the Speaker icon to hear your caller’s voice through iPhone’s built-in loudspeaker. Audio Source: You see this button in place of the Speaker button when you have a Bluetooth headset or Bluetooth calling in your car paired with your iPhone. Add Call: Tap Add Call to put one person on hold and call another and also to set up a conference call. Use FaceTime: Tap FaceTime to switch your current cellular call to a FaceTime Audio or video call, which uses a Wi-Fi or cellular data connection. Contacts: Tap Contacts to browse your contact cards to do things like find and share a phone number with the person you’re currently speaking with, or choose another contact’s phone number that you want to call while engaged in your current call.